Thank goodness we’ve been busy listing and selling a lot of property lately. The 360-degree home tours and advanced marketing we’re employing to go out and create buyers for our listings is working. We have noticed a trend recently we thought we’d try to clear up. SW Florida home sellers are confused when they read headlines that home prices were up 11.3% in August. They’re interviewing agents and they aren’t hearing the higher prices they were expecting, so they’ve called us out to verify what’s really going on in the market. We decided to present the chart in a different way. Agents have been telling sellers there’s been a shift since we reported on it back on February 16th. Sellers aren’t seeing it though because they read the headlines. 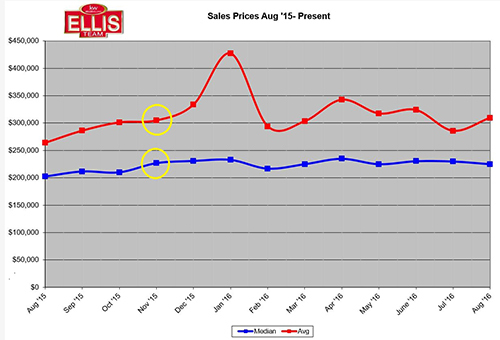 It is true, median prices are up 11.3% over last year. However, they are down $5,000 from last month and down $2,000 from where they were last November. Unless home prices rise in the next few months, we’ll be looking at essentially a flat line since last November. In other words, home prices aren’t statistically rising right now. The rise occurred last year up until November, so when you read that home prices are up over last year, they are until we get to November. They are actually down month over month as much as they are up which is creating the flat line. It is possible prices could start rising again. Perhaps after the election consumer confidence will grow. I think everyone can agree they’re tired of the political season and just want it over with as soon as possible so we can move on with our lives. We see the Fed raising rates at their December meeting. Interest rates have been quietly rising the past few weeks and we see more of that in 2017. Rising rates typically do not help home prices rise because it steals affordability from the buyer. Basically, when rates move up 1% it robs the buyer of about 11% purchasing power. In other words, a $400,000 buyer putting 10% down could finance $360,000. If they lose 11% purchasing power, for the same payment they can now finance 320,400. They lose $39,600 in purchasing power. Their payment remains the same as if they were financing $360,000 and paying $400,000 earlier before rates went up. This is why rising rates does not help home prices. Rising rates can spur home buyers who have been on the fence to buy now so they will save money on payments, but it doesn’t help prices long-term. This is one reason choosing the right Realtor to list your home will become even more important. You need a Realtor who has sold during a rising rate environment. I venture to guess that over 80% of agents today have not been in business long enough to experience that. How you sell in a rising rate environment is vastly different than in a stable or lowering interest rate environment. Marketing becomes more critical as well. If you’re a buyer, I would seriously consider buying now. It will cost you to wait. Prices may still rise, just not as fast. Or they may remain stable. The only advantage to you might be more inventory to choose from. The disadvantage will be that it will cost you more to buy the same house next year, simply because of rising rates. If you’d like to search the market, check out www.LeeCountyOnline.com You can beat out other buyers to hot new listings as our database is updated every 5 minutes directly from the MLS. SW Florida home sellers, if you’re considering making a move, you should call us now. 239-489-4042. Or visit LeeCountyOnline.com and get a free computerized estimate of your home’s value. Please call us if we can help. Good luck and Happy Home Buying! Our Paint the Town Red event was a success. We had over 35 properties open in one day and produced several interested buyers for our properties. Be on the lookout for our next open house extravaganza. Don’t forget to enter our contest so you can win a Yeti Cooler. Posted in Cape Coral, Cape Coral Real Estate, Fort Myers, Fort Myers Beach, Fort Myers Real Estate, Southwest Florida Real Estate, Waterfront Homes.Tagged Open House Extravaganza, ready for a yeti, SW Florida Home Sellers.